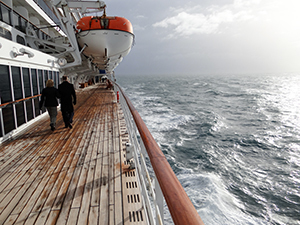 Crossing the Atlantic Ocean aboard the iconic Queen Mary 2 is a truly unique travel experience. Actually, for anyone who has ever enjoyed sea days aboard a cruise ship, that experience should be at the top of a “to-do” travel list. The QM2, which carries more than 2,000 guests, is 17 decks high – approximately the equivalent of a 23-story building. And it’s roughly the length of four football fields. Incredibly, the remastering was quite a numbers game. Just as incredible, the job included 1 million man hours in dry dock and 4,000 pieces of lovely new artwork. For anyone who has sailed before on this beautiful ship, the changes boggle the mind. Carpeting and soft goods throughout are new. (Think about an order of carpeting that would covered three and half stadium soccer pitches!) More than 300,000 individual new tiles from 6,200 boxes are now in place in the King’s Court. And that’s just a sampling. 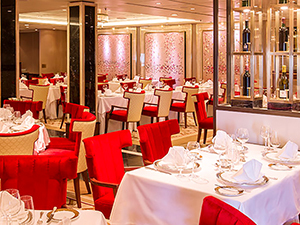 In my opinion, for first-timers aboard QM2 it’s a wonderful opportunity to enjoy the luxury life. It was so wonderful before the remastering – and now it’s even better! 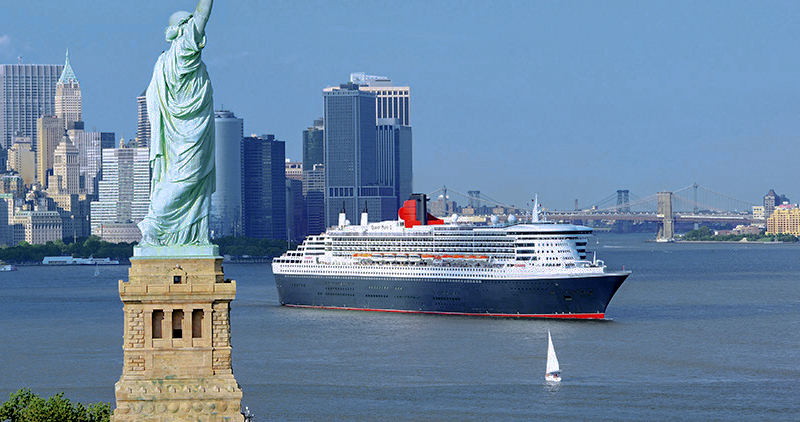 I sailed from New York – actually from its home port in Brooklyn – to Southampton in early September. I had sailed aboard the ship earlier, and the remastering blew me away. As someone who often travels alone, the new single cabins aboard the vessel looked amazing to me, and I was eager to try them out. The single cabins are located on Decks 2 and 3. First, they feature a full-size bed, large closet and storage space. Second, they also have a desk that doubles as a makeup table and a well-designed bathroom. 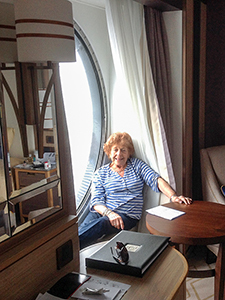 My cabin, 3004, offered two wide circular windows overlooking the sea. It was comfy place in which to read or to have room service breakfast before setting out for the day. Furthermore, its wondrous shades of blue made my home-away-from-home for the crossing an incredible sanctuary at sea. As you might imagine, the 15 single cabins are a hit. Also a hit are the kennels, high atop the ship. There are 24 of them, the only ones on a North Atlantic cruise. Every dog has its day: one dog has done the crossing on Queen Mary 2 25 times. The two kennel masters take fastidious care of them all. The elegant Queens and Princess Grill suites have undergone extensive redoes. Also, the restaurants where Grill guests dine appear brand new. One of the most notable and well-received features of the redo is the Carinthia Lounge on Deck 7. There you can enjoy specialty teas and coffees with a light menu. Also, since Port wines are very popular in the lounge, the ship showcases an impressive selection. On the other hand, the Carinthia Lounge is a bit like having a “cuppa” in a friend’s living room. It features a beautiful décor of blue and yellow with touches of white throughout. Notably, Kings Court, the Lido type/buffet eatery, offers 80 new lunch and 50 new dinner dishes. Dinner features an Italian menu, with Indian, Pan-Asian and Mexican themes, one each night in the sprawling food serving area. Open, bright and very welcoming, it’s a great pace to meet friends for a burger or for dinner. Also, meals in the beautiful Britannia dining room are always exciting. I was fortunate to also dine in the posh Princess Grill where elegance and grace are always the first course. In any case, my fave lunch spot is the Golden Lion Pub. It’s open daily from noon to 2:30 and offers a pub lunch including outstanding fish and chips. On the other hand, Godiva is a wonderful new space featuring Godiva chocolates – and not just luscious candies. It offers outstanding drinks with the Godiva flavoring. Of course, as you may have guessed, it’s proving a big hit for after dinner. And also, during an afternoon snack, or whenever a fine chocolate craving rears its ugly head! The Verandah is also a fine dining alternative. For example, Canyon Ranch Spa offers a variety of marvelous massage and facials. On the other hand it also offers talks on subjects that can range from acupuncture to hair coloring. The sprawling two-deck library offers everything in today’ media. Conversely, if you want to enjoy only the daily Afternoon Tea served elegantly in the lovely Queen’s Room, do it! 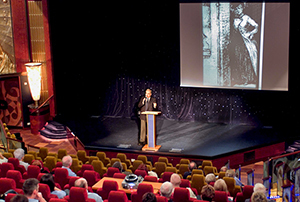 In addition, daily schedules include thought-provoking Cunard Insight lectures. 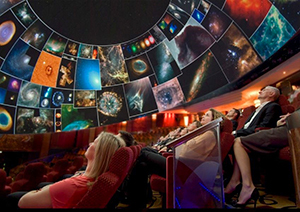 These can range from hunting down Jack the Ripper to what to expect in the Planetarium. Interestingly,one discusses the 30 million people who crossed the Atlantic from 1814 to 1914, the greatest migration in history. As you might expect, there are classes in Internet and iPad usage; another is how to get the most out of your travel photographs. Also expect trivia and darts competitions, dance lessons and movies. Music from jazz to classics – and everywhere in between – is available all day long. In any case, shoppers will love being able to shop ‘til they drop the packages off in their cabins. And on a brisk day on the North Atlantic, maybe wrapping up in a warm blanket and taking a fresh-air nap is all you need. I got involved in something on Queen Mary 2 that I loved. In the newspaper listing of onboard activities there was a request for people to sing with the National Symphony Orchestra. Its conductor was Anthony Inglis, a Grammy nominated conductor who brings the orchestra aboard once a year. 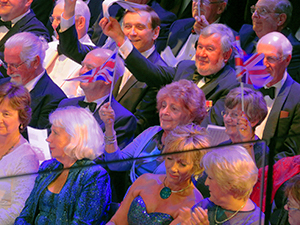 Volunteer choirs sing along with the orchestra, on stage in the Royal Court Theater at the Orchestra’s final performance. In any case, despite not having a great voice, I love music and enjoy the experience, and have sung with other choirs over the years. We had two rehearsals and performed. It was a treat. (The orchestra will appear on the ship next September and will be looking for volunteers.). Sounds truly first class. I appreciate hearing about this. Thanks so much! It really is first class and a classic case of week-long luxury. Good prices are currently being offered.